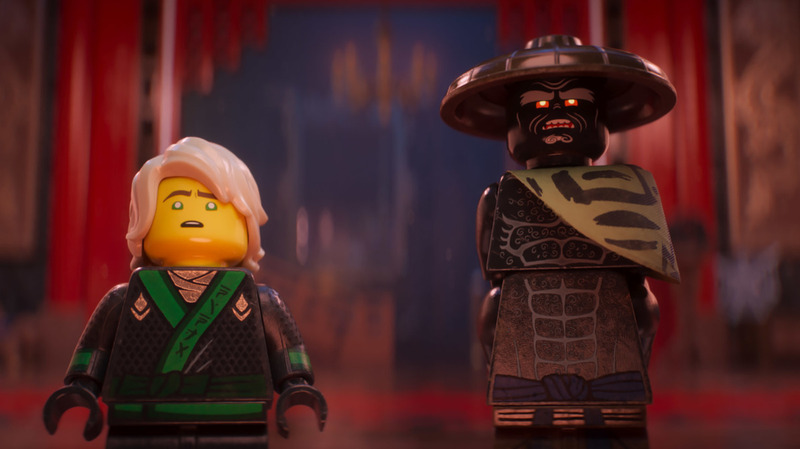 Plastic Less-Than-Fantastic: 'The LEGO Ninjago Movie' LEGO films have become their own genre, and despite stellar voice work from Justin Theroux as the evil Lord Garmadon, the genre is — surprisingly — already showing its age. If It's Not Brick, Don't Fix It: Lloyd, voiced by Dave Franco, and his father Garmadon, voiced by Justin Theroux, in The LEGO Ninjago Movie. In 2014, the directing/screenwriting team of Phil Lord and Christopher Miller surprised a cynical, jaded nation that was expecting, from The LEGO Movie, a cynical, jaded toy commercial. It was that, to be clear. But it was also frenetic, funny, colorful, clever and desperately eager-to-please: a hugely imaginative joyride through a riotous landscape of Warner Bros.-owned intellectual property. Movie as theme park. Mostly, though, it possessed something few putative tentpole blockbusters have any interest in attempting, much less manage to achieve: a distinctive, idiosyncratic style. That style emerged not from the too-crowded-by-half plot, which doled out discrete parcels of loud action set pieces and "Cat's in the Cradle" sentiment with a dutiful precision borne of studio notes and test marketing. No, its style was a product — weirdly enough, for a movie starring digitally animated but barely animate plastic figurines — of casting. Try, right now, to quote a line, a joke, a running gag from The LEGO Movie, or its successor, The LEGO Batman Movie. Go ahead: There's plenty to choose from. Having trouble? That's because these movies aren't really about the multitudinous (solid! very good! frequently hilarious!) gags stuffed into their scripts via studio-sanctioned punch-up sessions. As satisfyingly joke-dense as these movies get, they only come alive in their vocal performances. Hiring voice talent like Chris Pratt, Will Ferrell, Elizabeth Banks, Will Arnett, Nick Offerman, Zach Galifianakis, Ellie Kemper and Jenny Slate was smart: They're solid actors with instantly recognizable voices. But of course they're more than that. They can make a joke land, sure. Far more importantly, they're masters of comic timing, comic dialogue, which means they can wring laughs out of the subtle variations in tone that occur over the course of even the most mundane conversation. And in Lord/Miller LEGO movies, the mundanity of a given conversation is frequently the joke. The Joker: It's gotta be one or the other, Batman. Save the city, or catch your greatest enemy. You can't do both. Batman: I'm sorry, what did you just say? The Joker: You can't do both, I said. Batman: No, I mean the other thing. The Joker: Save the city, or catch your greatest enemy. The Joker: Yes! You're obsessed with me! Batman: [blows a raspberry] No, I'm not. The Joker: Yes you are. The Joker: Yes, you are! Who else drives you to one-up them the way that I do? The Joker: No, he doesn't. The Joker: SUPERMAN'S NOT A BAD GUY. On the page, sort of funny. Onscreen — thanks to Arnett's deadpan monotone and Galifianakis' ability to modulate the Joker's overblown arch-villain persona with the unforced, naturalistic exasperation of a guy confronting the co-worker who refuses to admit she ate the GoGurt he was saving in the office fridge — something more. What we didn't realize — until now, with the release of the dutiful, oddly joyless LEGO Ninjago Movie — was that they weren't building a franchise. They were creating a wholly new genre. Franchises are about marketing, but genres are about content, and the strict narrative parameters that surround that content. High fantasy needs swords, steampunk needs gears/blimps, romance needs someone (or something) to, at some point or another, throb. 1. Loud, colorful, breathless action? Check. The city of Ninjago comes under constant, loud, explosive attack from the evil, volcano-dwelling supervillain Lord Garmadon (voiced by Justin Theroux). It is defended — constantly, loudly, explosively — by a team of color-coded ninjas and their fightin' mechs. There's Nya the Water Ninja (Abbi Jacobsen), Cole the Earth Ninja (Fred Armisen), Jay the Lightning Ninja (Kumail Nanjiani), Kai the Fire Ninja (Michael Pena), Zane the Ice Ninja (Zach Woods) and Lloyd the Green Ninja (Dave Franco). 2. Standard kid-movie emotional toolkit? Check. Lloyd, see, is Garmadon's son — a fact that makes him a pariah at school, and bestows upon him the requisite Daddy Issue that sets the action in motion. There's also a more-than-generous helping of "The power is inside you!" on hand, and the team's mentor Master Wu (Chan again) dispenses the bromides about teamwork and believing in oneself you fully expect him to. 3. Pop-culture gags by the metric ton? Check. 4. Constantly undercutting the film's deliberately overblown genre trappings with surprisingly naturalistic dialogue that explicitly questions those trappings? Check. The film's stellar supporting cast gets not nearly enough to do — so little that viewers are left to impute the nature of many of the relationships among them. (Nanjiani's Jay is meant to have a crush on Jacobsen's Nya, I think? Based on one line?) That's the bad news, and given the talent on hand, that news ... is pretty bad. But what's shunting all those very funny actors into the background is the relationship between Franco's aching-for-connection Lloyd and Theroux's blithely evil Garmadon. And Theroux — deliberately channeling, he has stated in interviews, Will Arnett — is so fantastic here you almost forgive Garmadon's hogging of the spotlight. Almost. There's a moment early on in which Lloyd and Garmadon confront each other: Lloyd keeps trying to get Garmadon to admit he feels something for his son in the face of Garmadon's comprehensive indifference. It is not simply an iteration on the Batman/Joker dynamic referenced above. It is precisely the same dynamic, expressed in precisely the same way. One exchange could have been cut-and-pasted onto the other. Yes, but is it funny? Sure. And that's what matters. But it's funny solely because of what Franco and (especially) Theroux bring to it. And that doesn't bode well for future Lord/Miller LEGO movies. They can and will continue to bring the action, emotion and gags that their nascent, self-created genre demands — but it's now clearer than ever that those factors matter far less than the specific execution of a given film's vocal performances. We're left to conclude that the distinctive style we first glimpsed in The LEGO Movie wasn't as alive and organic and messy as it seemed then, but was instead a product of discrete elements, factory extruded, that lock together with a satisfying, but entirely plastic, click.